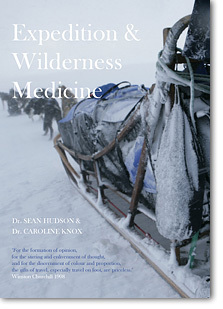 Buy the Expedition and Wilderness Medicine Book online! Visit the Expedition and Medicine website now and you will be able to purchased one most of the most comprehensively written handbooks compiled specifically with medical professionals in mind. Available as a down-loadable PDF for £15 where no trees were harmed in its production or as hard copy for £18 including post and packaging– this A5 size booked by Drs, Sean Hudson and Caroline Knox, featuring the expedition photography of Mark Hannaford and written with the support of Across the Divide Expeditions is sure to be an instant best sellers … well at least in the circles we move in! a ski field doctor in New Zealand; spent a season in the Antarctica and acted as an advisor to the Foreign Office following natural disasters. Since 1998 he has worked for Across the Divide Expeditionsas medic and expedition medicine advisor, providing medical cover on expeditions in 21 different countries. Dogsledding to Desert trekking in Namibia. Mark Hannaford graduated with a degree in Geography and a profound appetite to explore the world. He spent some time with UK TA Special Forces and is the founding director of both Across the Divide Expeditions and Expedition Medicine. He has been involved with expeditions for over 23 years and has led expeditions to all of the worlds continents with Raleigh International, Linblad Expeditions, Explore, Discover Adventure, Noble Caledonia and Across the Divide Expeditions. Piers Carter graduated from Birmingham University with a degree in Physical Education, which he then followed up with a PGCE in PE and English. He has been involved in expeditions to Southern Africa, Australia and has recently returned from Cambodia and is the founder and director of an innovative training and development company based near Sheffield called Carter Wade, which specialises in creative learning experiences for organisations and their people. Theo Weston.A full time G.P. in semi-rural 10 partner practice in Penrith, Cumbria, since 1982. He joined the Practice after spending several years following G.P. Training going on expeditions to various parts of the world as expedition doctor, including Greenland, the Kashmir, the Yukon, a transatlantic sailing trip on board a square rigger and to the Bahamas.He was drawn to the Lakes, where he grew up, because of the opportunities to walk, climb and sail, and has been a Medical Officer on the Patterdale Mountain Rescue Team since returning to Penrith. He is also Chairman for the local Pre-hospital Immediate Care Scheme(B.A.S.I.C.S. ), is actively involved in attending all road traffic accidents and other emergencies in a radius of 10-15 miles from Penrith and has set up a charity to fund an immediate response vehicle, which is used by doctors to perform this work. The book, the second edition, contains the following chapter titles. Denny Levett. Trained in Cambridge and Oxford before moving to London to pursue a career as an intensive care physician. Took a career break for a year to indulge in a passion for diving working as the expedition doctor on two marine biology expeditions in Tanzania and The Hallaniyat Islands. Worked as a medic for Across the Divide Expeditions since 1999 accompanying trips to Nepal, Guatemala, Chile and Peru. Denny combines work and play as Deputy Director of the Centre for Aviation, Space and Extreme Environment Medicineat University College London. Honorary lecturer in diving physiology at UCL and clinical lead of diving and hyperbaric medicine research division. She was the medical lead on the Caudwell Xtreme Everest Expedition. Mike Townend. Writer and lecturer on travel medicine, Hon Clinical Teacher, University of Glasgow and Tutor in Travel Medicine, St Martin’s College, Lancaster. Author of Travel Health for the Primary Care Team and contributor of chapters to other books including Travel Medicine and Migrant Health. Member of the Executive Committee of the British Travel Health Association. Mike was a GP in Cockermouth for many years and a member of the Cockermouth Mountain Rescue Team. He has participated in several Himalayan expeditions and overland travel through Europe and Asia. He now takes groups abroad involving activities such as trekking and white water rafting, acting as group leader and doctor. These activities take him Europe, North Africa, Nepal, Bhutan, South America and South East Asia. Kathy Wilson.Qualified 1986 form Edinburgh Dental School and has worked in Maxillofacial Surgery, the Community Dental Service and Newcastle Dental School and Hospital. Present role is working with those with Special Needs and in the field of Conscious Sedation for Dentistry. Have always enjoyed travelling and shortly after qualifying worked in Australia for 6 months. Have carried out voluntary dentistry in Nepal, Israel and Africa where basic facilities prevail. Chapter 2 Expeditions in the field. Wilderness, Expedition and Disastor Medicine Expo and Conference.